A 91% population decline was observed in two known subpopulations between 1987 and 2007 due to urban expansion, poor fire management, high levels of herbivory and harvesting for horticultural purposes. The two subpopulations represent two locations that are severely fragmented and declining. AOO 0.05 km². A population viability model incorporating four different management scenarios was developed for the subpopulation protected within the nature reserve based on demographic data collected between 1987 and 1996 (Pfab and Witkowski 2000). The model predicted an 88% probability of extinction within 20 years based on the management practices that was in place at the time. Recommendations were that fire frequency should be increased, herbivores excluded and ex situ individuals be introduced into the population to bring down the extinction risk to 2% within 100 years. The reserve management however conceded only to increase the fire frequency in the reserve, which still meant a 58% probability of extinction within 50 years. This subpopulation has by 2008 declined to less than 10 mature individuals due to the ongoing impacts of herbivory by native antelope as well as rodents (R.H. Archer pers. comm.) and possibly disease (M. Leroy pers. comm.) The other remaining subpopulation is under severe development pressure and is continually being degraded by human impacts due to its situation on the urban edge. Gentle slopes of quartzite ridges in savanna. Threatened by inappropriate reserve management, illegal harvesting for the succulent trade and habitat loss to urban expansion. Monitoring of the two known subpopulations of E. clivicola indicated a 91% decline in mature individuals in the last 20 years (1-2 generations). 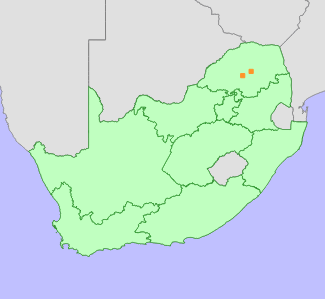 Declines resulted due to urban expansion of Polokwane impacting on one subpopulation, and unfavourable management practices of the nature reserve where the other subpopulation is located. This species is also a highly sought after item for succulent collectors (Fourie 1984), and despite being Red Listed, on Cites Appendix II and protected under the former Transvaal Nature Conservation Ordinance's schedule of protected plants, plants are still traded (P.J.D. Winter pers. comm.) Studies on the ecology of E. clivicola indicated that it requires regular burning and is sensitive to high intensity of herbivory, which is impacting on the subpopulation in a nature reserve that is overstocked with native antelope (Pfab and Witkowski 1999a, b). A population viability model incorporating four different management scenarios was developed for the subpopulation protected within the nature reserve based on demographic data collected between 1987 and 1996. The model predicted an 88% probability of extinction within 20 years based on the management practices that was in place at the time. Recommendations were that fire frequency should be increased, herbivores excluded and ex situ individuals be introduced into the population to bring down the extinction risk to 2% within 100 years. The reserve management however conceded only to increase the fire frequency in the reserve, which still meant a 58% probability of extinction within 50 years (Pfab and Witkowski 2000). This subpopulation has by 2008 declined to less than 10 mature individuals due to the ongoing impacts of herbivory by native antelope as well as rodents (R.H. Archer pers. comm.) and possibly disease (M. Leroy pers. comm.) This subpopulation is now on the brink of extinction within only 10 years, which surpasses even the worst case scenario of Pfab and Witkowski's study. The subpopulation on the urban edge of Polokwane has remained fairly stable within the last 10 years, mainly due to the absence of herbivory. There has likely been sporadic declines due to collecting and ongoing habitat degradation. The development pressure on this site is intense, but development applications have so far been turned down under new EIA regulations due to the potential impact on E. clivicola (M. Leroy pers. comm.). One subpopulation is protected within a nature reserve, but has declined to the brink of extinction due to inappropriate reserve management. Fourie, S.P. 1984. Threatened Euphorbias of the Transvaal. The Euphorbia Journal 2:75-90. Pfab, M.F. 1997. Can we prevent the extinction of Euphorbia clivicola? Veld & Flora 83(1):26-27. Pfab, M.F. and Witkowski, E.T.F. 1997. Use of Geographical Information Systems in the search for additional populations, or sites suitable for re-establishment, of the endangered Northern Province endemic Euphorbia clivicola. South African Journal of Botany 63(6):351-355. Pfab, M.F. and Witkowski, E.T.F. 1999. Contrasting effects of herbivory on plant size and reproductive performance in two populations of the Critically Endangered species, Euphorbia clivicola R.A. Dyer. Plant Ecology 145:317-325. Pfab, M.F. and Witkowski, E.T.F. 1999. Fire survival of the Critically Endangered succulent, Euphorbia clivicola R.A. Dyer - fire avoider or fire tolerant? African Journal of Ecology 37:249-257. Pfab, M.F. and Witkowski, E.T.F. 2000. A simple population viability analysis of the Critically Endangered Euphorbia clivicola R.A. Dyer under four management scenarios. Biological Conservation 96:263-270.